If you've been looking at new CPAP machines I'm sure you've noticed there are quite a few from which to choose. The task of selecting a CPAP machine can be confusing because there are so many machine models from various manufacturers, and a lot of the models have similar sounding names and even look virtually identical to one another. 2. features you want on the machine - like exhalation pressure relief, humidifier, heated tube, automatic adjusting pressure, etc. 3. desired physical characteristics of the machine - like small, lightweight, easy to carry, etc. The most common question we answer every day is with regard to automatic machines. People want to know the difference between an automatic machine and a standard machine. It's good to know the difference so you can make a more informed purchasing decision. A standard CPAP machine works by delivering a fixed pressure, usually prescribed by a doctor and based on a recommendation from a sleep study report. The fixed pressure from the CPAP machine acts as a stent to keep the airway open during sleep. With a standard machine, the prescribed pressure is programmed into the machine and the machine blows at that prescribed pressure all night long. This pressure prevents the airway from collapsing so that tissues in the airway do not obstruct airflow or restrict breathing. Most CPAP machines have a pressure range of 4 to 20 cm H2O, so the programmed pressure will be a number in that range. The most commonly prescribed pressures are 8, 9 and 10 cm H2O. The interesting thing about the prescribed pressure is that it's usually only based on one night of sleep (or less) during a sleep study. I'm sure you can see where I'm going with this. One night may give a pretty good indication of the amount of pressure you need, but a sleep study is really just a snapshot in time. You'll come away knowing the pressure you needed that particular night, under those particular circumstances, in that particular bed, in whatever position you happened to be sleeping in. The thing is, though, is that snapshot might not be an accurate representation of how you sleep and breathe every night at home in your own bed. Now, don't get me wrong. I'm not saying titration studies aren't important or useful. I'm just saying that a CPAP user's pressure needs might change over time, and that a single titration study can't possibly account for future circumstances. For instance, if a CPAP user gains weight, the pressure requirement may change. If the CPAP user's airway becomes more obstructed when he sleeps on his back as opposed to on his side, the pressure requirement may change. If the titration study results were incorrect for whatever reason, the pressure requirement may change. This is where an automatic CPAP machine really shines. An automatic machine delivers a continuous flow of air to act as a stent to keep the airway open, just like a standard CPAP. But, the primary benefit of an automatic machine is that it constantly adjusts the pressure level throughout the night, and does so on a breath-by-breath basis. An automatic device uses a pressure sensor to detect flow limitations and vibrations in the airway, and categorizes different flow limitation events and vibrations as apneas, hypopneas or snoring events. Different machines have different algorithms for detecting flow limitations and responding to them. The DeVilbiss IntelliPAP AutoAdjust defines an apnea as 10% flow (or 90% obstruction), and defines a hypopnea as 50% flow (or 50% obstruction), each for a period of 10 seconds or more. The IntelliPAP categorizations are noteworthy because they're adjustable, and the IntelliPAP is the only automatic device available that allows adjustment of the definitions of apneas and hypopneas. In other words, the "sensitivity" of the IntelliPAP can be adjusted to change how the machine responds to your breathing. Pretty cool, really. Automatic machines also record all of the detailed flow limitation data so that the data can be analyzed later. For most CPAP users this isn't a significant benefit, but for some, being able to see the data for themselves or being able to share the data with their doctor is important. The bottom line here is that all automatic machines offer functionality and data reporting capability that can be used in place of a sleep study. In fact, many sleep centers use the very same automatic machines we sell to conduct sleep studies and to gather the data needed to make a pressure recommendation. A prescription is required for any type of CPAP device, even an automatic one. Many physicians are reluctant to prescribe a CPAP device unless the patient has been through a recent sleep study. Of course, this reluctance is due to the physician not necessarily knowing what pressure to prescribe, and so the reluctance is understandable. 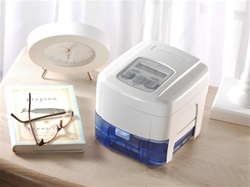 We routinely advise new customers who are trying to buy a CPAP machine - either for the very first time, or for the first time in a long time - to talk to their doctors about prescribing an automatic CPAP machine. Many doctors are receptive to this idea. It's a great way for a veteran CPAP user to get a new machine without having to endure another sleep study, and it's a very cost-effective way for someone new to CPAP therapy to start with just a diagnosis from the primary care doctor. Now you may want to take a look at an article I wrote 6 years ago about the benefits of automatic CPAP machines. That article highlights some other advantages of automatic machines that might be interesting to you. If you weren't already familiar with auto adjusting CPAPs, then you're probably thinking two things right now: 1) they sound like a really good idea, and 2) they must be expensive. Still don't know which type of machine you need? Don't worry about it. Give us a call at 1-888-955-2727 and we'll get you all straightened out. That's what we're here for! We'd love to have the opportunity to earn your business, whether you need a new machine or CPAP supplies for your existing setup.